Congratulations to "Brooke B." and "Jo-Anne B. ", the winners in Anne's giveaway. Thank you to all who participated. I am neither British nor a detective, but I write about British detectives. Furthermore, these detectives tend to interview shady characters who are smoking, even though London does not allow smoking in public places. My detectives carry “nightsticks,” even though in England the weapon is called a “truncheon.” Worst of all, the characters in my books tend to have successive work days when there really should be a weekend thrown in there somewhere. In my own defense, shady witnesses should always smoke and smirk—that’s how we know they’re shady in the first place—and when the good guys are hot on the trail of the killer, it really disrupts the pacing to have everyone take a Sunday break. And would you have known what a truncheon was? I didn’t think so. When she started out with “A is for Alibi,” Sue Grafton’s books were specifically set three months in time after the one before, even though the books were published a year apart. Now that she is up to “W,” she is essentially writing historicals, set in the 1980’s. I imagine if she had it to do all over again, she’d adopt my own vague-time-continuum rather than have to study up on historical accuracy when all she really wants to do is write great contemporary mystery. But, as she jokingly admits, when she started out she never thought she’d be where she is today. Some writers are sticklers for accuracy and some—like me—are not, but I would bet we get the same amount of mail pointing out our missteps. That’s because writers like me take great pains to be vague about details that might trip us up; if we’re not tethered to a plot that requires keeping track of the days of the week, well then, there is no reason whatsoever to mention what day it is. In a way, it’s very liberating; the New Scotland Yard in my stories is my own version of Middle Earth, complete with larger-than-life themes like love and death, fate and vengeance, and the occasional hand-to-hand office skirmish. I know the real building in London contains cubicles, personnel who are jockeying for promotion, and a canteen—and these three elements are all that is needed to create a setting sufficient for my purposes. In fact, when you think about it, much of what the reader expects from a detective story is not based on reality to begin with; there can’t be that many serial killers on the loose—or detectives whose personal lives are in such disarray. And certainly the crooks are not all evil masterminds; in reality, most are dim bulbs. But these are the beloved memes that we’ve come to expect from our detective fiction, and so we all start out the story with the implied understanding that accuracy will play a secondary role to a good plot—does anyone really think that Jack Reacher would have any unbroken bones left, after all he’s been through? The police procedural is a popular sub-genre, but the writer has to perform a tricky balancing act; give the reader sufficient accuracy to create an aura of authenticity, but not so much accuracy that the story suffers. To this end, the occasional liberty has to be taken; it just wouldn’t be the same to have a smirking witness exhaling clouds of water vapor from an electronic cigarette. Some things are sacred. Anne Cleeland is the author of Murder in Thrall, the first book in a new mystery series featuring Acton and Doyle, two Scotland Yard detectives. She is an attorney living in California, and also writes a historical fiction series. Her website is www.annecleeland.com. You can also locate her on Twitter at @annecleeland. 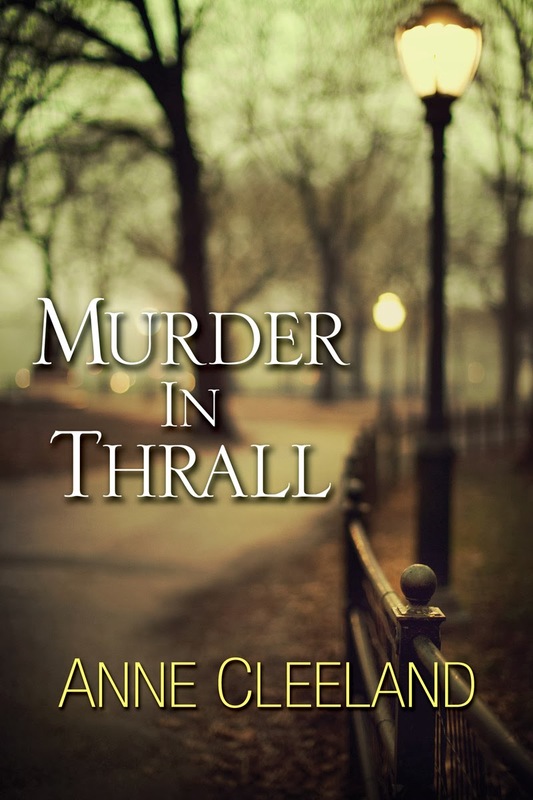 Anne will be giving away an ebook copy of Murder in Thrall to 2 lucky commenters or email entrants. Giveaway ends 11:59pm EST Jan. 14th. Please supply your email in the post. You may use spaces or full text for security. (ex. jsmith at gmail dot com) If you do not wish to supply your email, or have trouble posting, please email maureen@JustRomanticSuspense.com with a subject title of JRS GIVEAWAY to be entered in the current giveaway. Your title captures my attention! And it sounds like a fascinating series. Thanks so much, Jan! It was a lot of fun to write and I hope you'll love the two main characters--there's a strong romance element. I've actually read this book and would love my own copy. I LOVED it. It was like reading a Regency mystery set in modern times if that makes sense. It's because the characters are so proper. I actually want my own Acton. Thanks so much, knye! I'm glad you liked it! And a little correction, the giveaway is for hardcover first editions--not epub. Sorry this wasn't clear! That is even a better prize! Thanks for the chance. A mystery with Scotland Yard detectives is just the type of story I like to read. And I agree that smoking regular cigarettes is important to this type of story. There's no swearing, though, which only shows you that it's not very accurate, if you know any police officers! Thank you for this opportunity. Looks like my kinda book !!!,!!!!!!!! I liked reading your post! Thanks for sharing. :) Your book sounds great! I want to be enTHRALLed as I read. A gripping story can have all the historical, geographical and logistical inaccuracies in the world & I doubt I would even notice. This book sounds interesting. I agree with you about the joy is in the story itself not just the details. I look forward to reading this book and thanks for the giveaway!